Kalim Beach is one of the better surfing beaches in Phuket, located just to the north of Patong on the west coast. The beach or bay is really just a continuation of Patong Beach and the only thing separating the two beaches is a small rocky headland. At high tide the water around Kalim Bay has excellent coral reefs making it a great spot to go snorkeling or diving. At low tide, the coral reefs on the Northern end of Kalim are close enough to the shore to go exploring on foot. There is an amazing variety of living creatures here, such as starfish, tiny fish and seashells. The rocks are razor sharp, so if you are going to go exploring it is best that you wear strong sandals or joggers. You will often see the locals wandering around collecting crabs and shrimp. The beach is a little rocky and not what I would call a good swimming beach, there are no sunbeds or water-sports available here. The above picture of Kalim was taken at low tide, so if your looking for fun beach activities you will need to head to Patong. 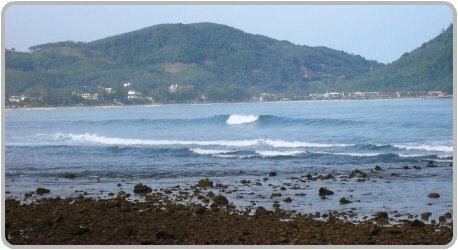 During the monsoon season from June through to September the northern end of Kalim is one of the better beaches in Phuket to go surfing. Kalim Bay is a nice beach for an afternoon walk, but not a beach that I personally would swim in. 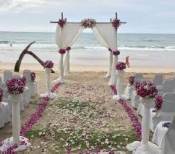 There is a good range of accommodation at Kalim from family friendly resorts and hotels to budget hotels and guesthouses. Below is just a few of the many resorts and hotels that are available. Kalim Resort is located about 15 to 20 minutes walk from Patong Beach, this boutique hotel is set around a very large swimming pool. Read more on Agoda. 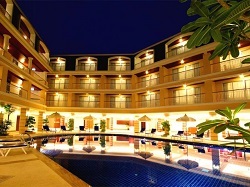 Sunset Beach Resort is perfect for those who want to stay slightly away from bustling Patong, yet be close to it. All of the rooms at the Sunset beach resort have private balconies with sea and pool views. Read more on Agoda. Diamond Cliff Resort and Spa has spectacular views overlooking Kalim Bay, The Resort has seven restaurants and bars, three swimming pools and several sunset viewpoints. 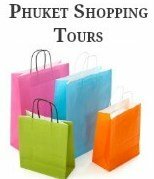 With free shuttle rides to Patong and Phuket Town. Read More on Agoda. 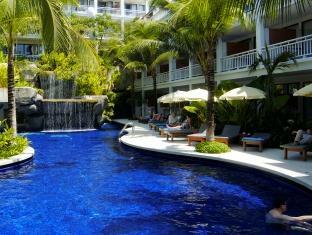 The Novotel Phuket Resort is located in the hills above Kalim Bay. There is a Kid’s Club that has a range of fun activities for the kids ensuring the whole family can enjoy themselves in comfort. The resort has 5 restaurants, a fitness centre, massage and sauna facilities, tennis courts and a three-tiered swimming pool. Read more on Agoda. 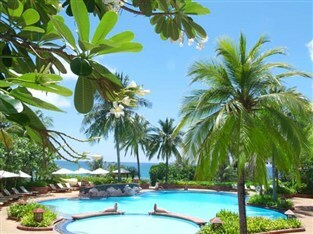 Kalim is a quiet alternative to the lively Patong Beach, yet close enough to the nightlife and shopping of Patong. There is not a lot of nightlife in Kalim, apart from the odd bar, but there is a great selection of restaurants which can be found overlooking the water. We have listed some of the best restaurants and bars that we have found on our travels that are located overlooking Patong and Kalim Bay. They include the Baan Rim Pa Piano Bar Restaurant with it's Royal Thai cuisine and breathtaking panoramic views from the beach of Patong to the bay of Kalim. It has long been established as one of the most famous restaurants in Thailand and a favourite of visitors from all over the world. Another is Joe's Downstairs Restaurant, also with stunning views of Kalim Bay. One of the best places in Phuket to enjoy a light lunch, refreshing cocktails at sunset or wine and dine the evening away. Next door to Joe's is Da Maurizio Bar Ristorante, offering one of the most romantic dining experiences in Phuket that serves fantastic Italian food a few feet away from the beach. Whitebox Restaurant and Lounge Bar is a vibrant mix of high class eating with a fantastic music lounge that rests on the sands of Kalim Beach. If you are looking for a place to unwind the roof top lounge bar is the ideal place to watch the sunset over Patong Bay, or to dance the night away. One of our favourite's was Lim's Restaurant it was one of the most charming restaurants in Phuket that served modern Thai cuisine and fresh seafood. Unfortunately Lim's closed its business in December 2017. Kalim is fast becoming an ideal alternative for an evening out for those who prefer to opt out of Patong's hectic nightlife. From Patong follow the Beach Road North, it is the rocky beach just before the the hills.